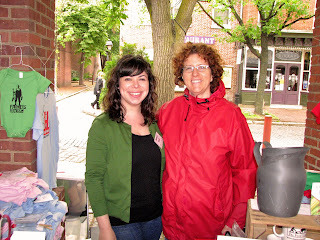 Sarah, Ethan, and I made our first ever trip to the Headhouse Farmers’ Market this past Sunday. I eagerly anticipated this trip all week and was crestfallen by the weather conditions, which resembled March more than May. Crestfallen…maybe crestfallen is French for “freezing my face off”. It was cold and windy and even though we prepared enough for the baby, Sarah wore one of her obligatory Phillies t-shirts and I wore cargo shorts. However, the chilling temperatures and overcast skies did nothing to gray our spirits – especially when we got there. If you are not familiar with the locale, the market is located on 2nd and Lombard Streets on the cusp of Center City and South Philadelphia directly inside the Headhouse Shambles. The “Shambles” (British word for butcher shop) was built in 1745, and is one of the oldest continuously used marketplaces in America. Ok, enough of the weather report and history lesson. Let’s get to the “meat and potatoes” of our trip! I met Tom Culton from Culton Organics. On his table I saw some deep green asparagus that people were picking up like they thought the green was money. My interests were piqued by his potatoes which Tom confirmed were an heirloom variety that used to be referred to as Nosebags, although now French Fingerlings were the preferred nomenclature (for obvious reasons). He further explained that the ancestors to the ones that were going to be on my plate came over to America in the feedbag of a horse. While Mr. Ed I am not, these potatoes looked good for mashing. I will keep you posted for the results. I also spoke with Mark Skinner from Natural Meadows Farm out of Mount Pleasant Mills, Pennsylvania, where I bought two pounds of grass fed ground beef which I will be cooking later in the week, probably for feta burgers (believe it or not, really really good, I will post the results, and the recipe later in the week). Mark was busy. He was selling multicolored, pastured eggs at a torrid pace. Mark also carries Heritage breed animals which are the actually ancestors of the original domesticated stock raised centuries ago. In a nutshell, while Industrial Agriculture breeds animals to withstand the rigors of the commercial market (bred to produce large amounts of milk or eggs, quickly gain weight, or yield particular types of meat within the confinements of the industrial farm or feedlot), Heritage Meats are from animals which are naturally selected and are adapted to the local environment. Because these animals can brave the local environmental conditions, they are raised in a sustainable manner (no need for anti-biotics or heated buildings). To boot, Mark also recycles your old egg containers. I met Thomas Murtha and Tricia Borneman at the Blooming Glen Farm stand out of Perkasie, P.A., where I bought some green onions which caught me by their smell. I didn’t know what I would do with them but I didn’t care at the time. So far, they have made their way into an egg salad and I am prepared to bake them on some salmon tomorrow. I also purchased two types of crisp looking lettuce, one of which Thomas explained was an heirloom variety named Red Leprechaun. How lucky could I be? After all of our purchases were done and our food budget expended, it was time to bid a fond farewell to Headhouse. Ethan’s carriage was loaded as we once again faced the harsh chill of late spring. On our way back to the car we chatted up a young mother with her 9 month old baby in tow. Here we were, strangers with a shared love for fresh food for ourselves, and for our children making a connection. Isn’t that’s what it’s all about? Making connections? Connecting with those who share our adoration for fresh food? Connecting with the people who coaxed our meals out of the Earth and through them, connecting to the Earth ourselves? Doesn’t that beat buying pre-wrapped Dole salad mix from Acme? I can tell you even before I taste the bounty we brought home the answer is yes. Wait until we taste it! We will be returning to Headhouse during the summer and meeting more people and buying more food and making more connections. You should come, you will not be sorry. Now I'm hungry! I remember when Headhouse sold crafts on Sundays. It always made the walk from the el to work nice as I had that to look forward to seeing along the way. You should post something on all the ingredients you purchased and the variety of meals you craft them into. It might convince those Dole salad bag purchasers to try something new. I look forward to reading it at least. Plus, it would showcase what's in season. Post pics too! Thats exactly my intention! You are so smart. There is actually a challenge being conducted by the Farm to Philly blog called One Local Summer 2009. You do exactly what you said and post about a meal that is made entirely out of local ingredients and post about it. Click on that tomato link and you will read all about it! I just checked out that site and it looks awesome. Make sure you get some locally grown lettuces. They actually have taste!